While the question seems easy to answer, there are in fact a variety of reasons affluent people invest funds in products and services that will produce more funds. Certainly, some investors play the investment game as a way to add to their bottom line. Other than working for a salary or compensation, investing is the most legitimate way to garner more money. But there are other investors for whom investing is a way to provide for retirement income. Placing funds in defined contribution plans, annuities and other scheduled distribution products provide income once an investor stops working and prevents them from raiding their growth products. Still others invest in order to set themselves up down the line. Perhaps they have actually placed a value level to their portfolio at which they will feel set for life, and their investments are aimed at reaching that level. 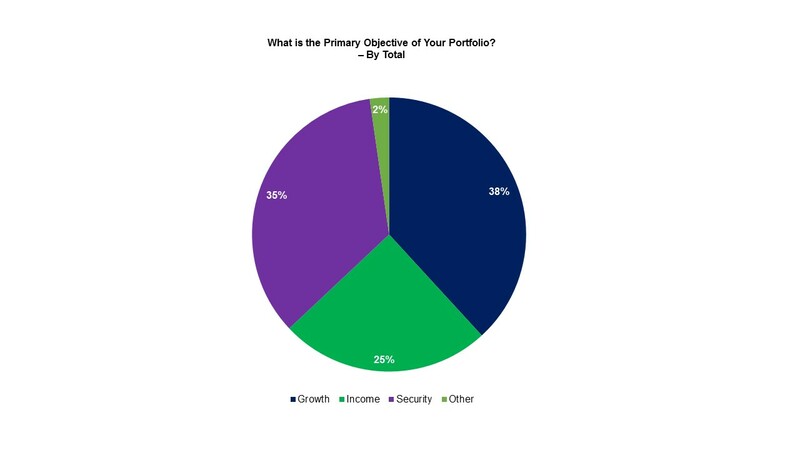 Spectrem’s annual look into the investment products owned by affluent investors asked survey respondents to describe their “primary objective’’ in undertaking the task of investing. The choices offered in Asset Allocation, Portfolios and Primary Providers were “growth’’, “income’’ and “security” and the results demonstrated how different investors approach investing differently. The study looked at product ownership and investment decisions among three wealth segments, ranging from investors with a net worth of $100,000 not including primary residence to those with a net worth up to $25 million. Among Millionaire investors with a net worth between $1 million and $5 million, 38 percent said they invested in order to increase their portfolio. Growth was most important among Millionaires who are Business Owners (49 percent), as well as the youngest Millionaires (77 percent of investors under the age of 37). That makes sense. When investors are young, they get involved in investing for growth because they are not yet thinking about the long-term implications of their investments, and have not yet completely understood the need to create post-retirement income. Advisors working with young Millionaires should attempt to explain that investing for retirement income at a young age can increase the amount of income they create and provide for an earlier retirement if desired. Among Ultra High Net Worth investors with a net worth between $5 million and $25 million, growth is less desired. Only 34 percent of UHNW investors selected “growth’’ as their primary objective. “Security’’ is the second-most popular answer to the question, although among UHNW investors, “security’’ and “income’’ are very close in appeal, with 32 percent selecting “security” and 30 percent selecting “income”. Just as age makes “growth’’ more popular among investors, younger investors were much less likely to select either “income’’ or “security’’ as their primary objective in investing. Determining how an investor approaches investing can also determine an investor’s risk appetite, as well as the need to diversify a portfolio. Advisors who work with a client aimed at growth will make different suggestions than an advisor working with a client looking for security. With the exception of relatively young investors, all decisions have a modicum of aim toward growth, income and security. In general, investments are aimed at creating a larger asset level, which can provide benefit in all three areas. However, advisors must know if an investor is specifically aimed at one of the three categories so advisors know where the account’s improvement must be displayed. Investors focused only on growth must be alerted to the eventual need for income streams, especially in retirement considerations. While some investors consider dividends and disbursements a key component of their investing, income matters eventually and young investors need to know they will be wishing they had income streams at some point down the line.